With all the exotic pies we’ve rated from Nice Pie - and you'll spot below that we've pie rated a fair few! - you’d be forgiven for thinking that they only do pies full of meat you’d never expect to be sold in a pie! And as delicious and highly rated as the kangaroo, wild squirrel and crocodile pies were (the latter being the highest rated pie from Nice Pie so far! ), they also cater for the more “typical” British pie eater too! So whether you want to take a walk on the wild side or stick to something more typical in your pie, you're in for a nice pie treat! We've been delighted to sample and rate so many of their pies in the last year or so - the reviews of which can all be seen here - but now you can see them all in our Nice Pie Leaderboard! Amazingly nearly every pie is Pierate Recommended (rated above 5/7) with some Pierate Highly Recommended - an amazing feat considering the weird and wonderful content of some of the pie fillings! The Nice Pies we've highly rated include our highest rated fish pie - Smoked Salmon and Broccoli - and unsurprisingly our highest rated exotic pie - the Crocodile, Leek and Potato pie! But they've not just been very highly rated with us! Their success has been rewarded with numerous awards from the Great Taste Awards to the British Pie Awards, where at the British Pie Awards 2014 we were delighted to hear that they had won the Champion Small Producer Award! You can see their amazing pie made for the WWI commemorations class in our British Pie Awards 2014 article. The full list of their awards can be found on their new website. One of the things that has made Nice Pie stand out to us is that they are always willing to try something new - as seen by their expanding traditional and exotic pie range, their constant striving for pie-fection and recently their accreditation as an Authentic Melton Mowbray Pie producer. And it's a sign of how far they've come in the last year that they had a recent visit from none other than celebrity chefs Jamie Oliver and Jimmy Doherty - some photos of which can be seen on the Nice Pie website! This was for the TV series Jamie and Jimmy's Friday Night Feast - which was on Channel 4 on Friday 13th February - and you can see a clip of it on the Channel 4 website here. Both pies were filled very well with strong marks for capacity and therefore even more impressive that you could pick up and hold a slice of the pie without it crumbling under the weight of the meaty content! The pastry was nice and golden in colour, with a tasty shortcrust pastry which was only a little crumbly in places. Each pie was £6.50, which is very reasonable for a large pie that could be shared between 2 or more people. 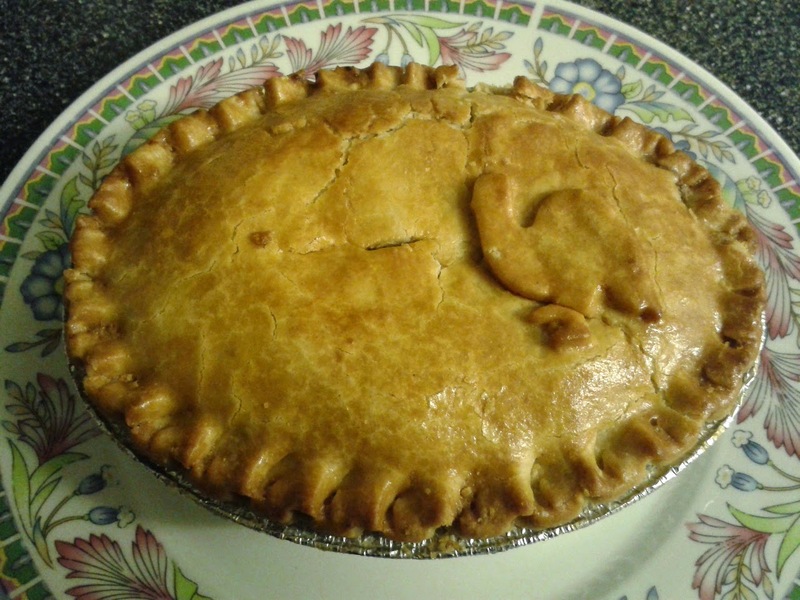 The Steak and Stilton Pie was one of the many Nice Pies to get a Gold award at the British Pie Awards 2014. 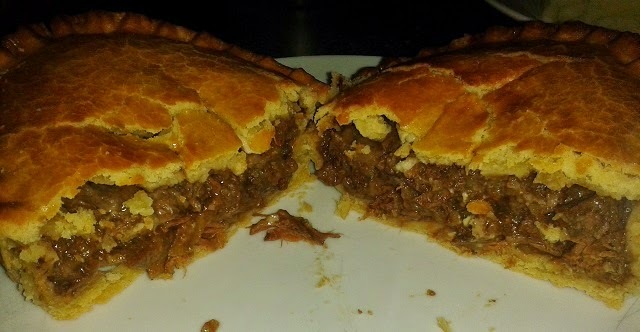 A common theme in the Nice Pie range, it was again packed to capacity with lots of moist, tender pieces of steak. You could tell the meat was well cooked and while there could have been a bit more gravy in the pie, the meat itself was moist and not at all chewy. While a bit of additional gravy would have made the pie as a whole that little bit better in my opinion, against the slightly drier pastry, you could not fault the quality and taste of the meat. The stilton wasn’t overpowering, as can be the case in some cheese-filled pies, but complemented the steak nicely. While I slightly preferred the Steak in a Rich Red Wine Gravy to this I would certainly have another Steak and Stilton too. The Cockrel Pie was again noted for its very good pastry:filling ratio. I’d never had cockrel meat before, and while I was a bit reserved before eating it, I was certainly surprised at how much I enjoyed the flavour. 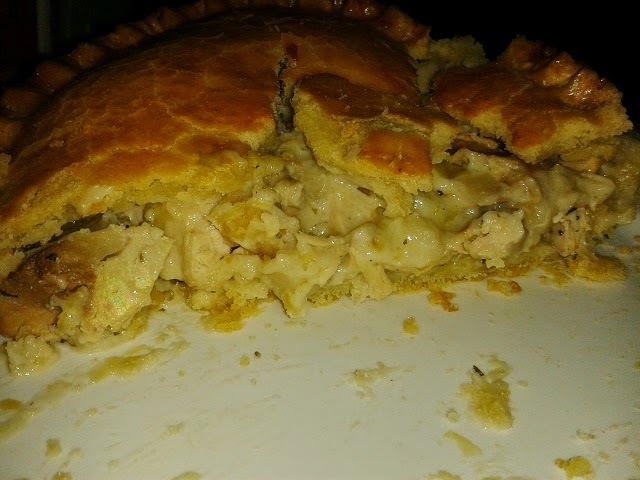 To me it tasted like the darker meat you would eat as part of a roast chicken meal, which has a bit more flavour to it even if it is not perhaps perceived as the best part of the chicken, with most pies favouring the breast meat. The creamy sauce was nice and the overall balance of the pie flavour was good. I’d certainly not turn my nose up at another cockrel pie, even if I’d say I'd prefer a chicken pie. Once again Nice Pie have produced the goods, with two more Pierate Recommended pies – and while it’s hard to resist the amazing range of exotic pies Nice Pie do, you would certainly be missing out if you didn’t tuck into a more traditional pie flavour from their range when given the chance!